TTipard PDF Joiner is the most professional PDF Merger to help you merge several PDF files into one. This PDF Merger provides you with an intuitive interface to make the operation quite easy. And there are more than one merging methods for you to select. You can select the page range and page sort. Moreover, this PDF Joiner can merge all files alternately. Then you can handle the output PDF file more conveniently. Please contact us with the contact form to report difficulties, strange behaviors or persistent problems, and quote the program name or the number 21899 . This is the download page for Tipard PDFJoiner - ipard PDF Joiner is the most professional PDF Merger to help you merge several PDF files into one.And there are more than one merging methods for you to select. You can select the page range and page sort.. This software allows you to choose your needed PDF pages. Moreover, it supports multi-languages: STurkish, Thai, Latin, Korean, Greek, Slavonic, Arabic, Japanese, Chinese, etc. After updating, it is highly compatible with windows 10. This PDF Joiner provides you with several merging methods. Tipard PDF Joiner offers you powerful merging function to merge several PDF files into one with perfect output quality. This PDF Merger enables you to select all, odd, even and part pages of PDF files to be merged. You are able to merge PDF files in sequence or in reverse order by choosing the appropriate option. 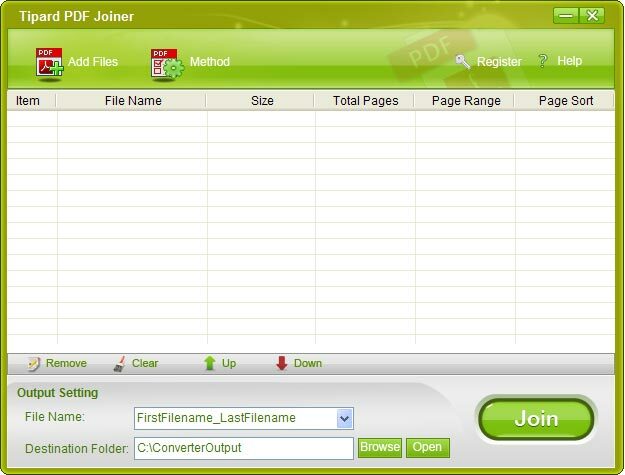 This powerful PDF Merger enables you to merge all PDF files alternately with the selected page sort and page range. You can define the PDF Joiner to mix pages by every n page(s). The user-friendly interface of this PDF Joiner can make the operation so easy that even beginners can finish the operation with few clicks. This PDF Merger supports English, Turkish, Thai, Latin, Korean, Greek, Slavonic, Arabic, Japanese, Chinese, etc. The special-designed PDF Joiner can help you finish the operation with least time.